As I Said...: Again, With The Craftiness! Woo hoo! Another piece of jewelry made by me! Next I'll have to do up some earrings to go with these, right? In all its double-tiered glory. 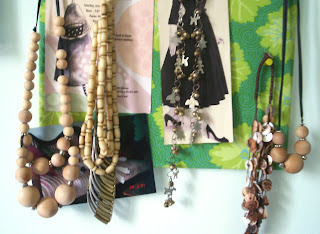 Just a peek at some of my other necklaces. 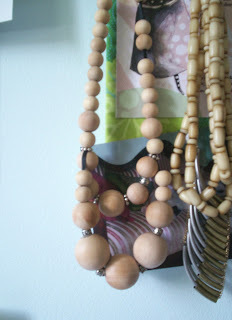 Next time, I work with these wooden beads I'm going to do something about painting them. 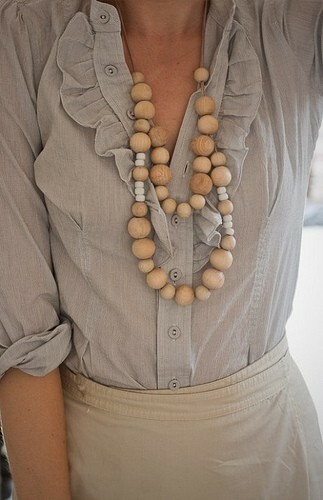 I really like that combination of soft neutrals — the grey + wood is so pretty! Reminds me of driftwood on the beach. This is a post to encourage you to keep going. One thing atta time!....LOL! These are lovely! I adore the look of chunky necklaces but never feel as though I can pull them off. You're so lucky you can! Very pretty! Love it with that blouse, too. 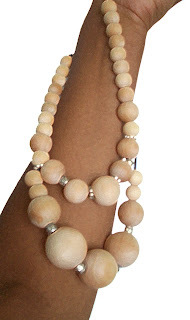 I have never been able to wear a necklace that length. I just feel all weird and awkward. They are either above the neckline or really long. You make it look so easy! What a beautiful necklace! I love the color of the wood beads with the silver.